Welcome to the “Happy Birthday to Me” edition of the blog. In two days I turn 47, and this is what I’d like you — yes, you — to get me for my birthday. Don’t worry, these gifts won’t cost you anything except a few minutes of your time. Your first option: if you’re a fan of my work and you have yet to leave a review for one (or more) of my books on Amazon or Goodreads, go do so. Reviews help entice new readers to try out books they’ve never heard of by authors they never heard of, and positive word-of-mouth is always the best publicity. Your second option: if you’re a fan of the Action Figures series and you know someone who might enjoy the books, take advantage of the free giveaway for Secret Origins, which begins next Monday and runs all week, by buying a copy and gifting it to a friend. If they don’t own a Kindle, they can download a free app that allows them to read the e-book on any device. 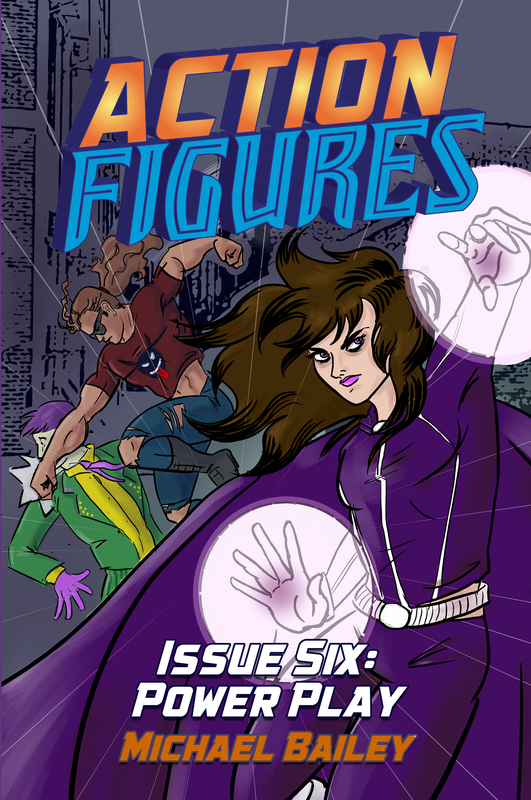 Now that I’ve gotten all that out of the way: Action Figures – Issue Six: Power Play is now officially available! The product pages for the Kindle and print editions might not be merged yet — chalk that up to idiosyncrasies within Amazon’s system — so for now go here for the Kindle version and here for the print version. Thank you to everyone who pre-ordered the book and pushed it onto a couple of Amazon Top Ten lists during its pre-sale period. The Adventures of Strongarm & Lightfoot – Blades of Glory: Got a little more work in, and I’m taking a long weekend for my birthday this week so I’ll have a couple of extra writing days this week. NEW! Saturday, April 22 and Sunday, April 23, 11 AM to 4 PM: New Bedford Book Festival. A couple of weeks ago I mentioned that I probably would not be able to do the spring New Bedford Book Festival due to a scheduling conflict, but I will have a presence there after all. My wife has graciously volunteered to represent me at the event, so she’ll be there to push paper on my behalf. I’ll miss chatting with readers, but I’ll make sure there are plenty of signed copies of my books ready for patrons to buy. This last bit is aimed primarily at fellow indie authors, so feel free to skip this. While my CTRF book signing is several months off, I’m spending the lead-in trying to think of ways to motivate the other invitees to talk up the event, because if the last two years are any indication, they don’t do much to promote it on their own. They simply showed up, set up, and tried to sell books, but they never put any effort into drawing attention to the faire in the days and weeks leading up to it. When my wife was vending at faires, I saw that attitude a lot from her fellow merchants. Veronica talked up the show constantly on her blog and her social media outlets, as did a few diligent others, but so many vendors put no effort into spreading the word, and it’s no coincidence that they were usually the first to gripe when they had a crappy run. I’ve seen that doing shows as an author as well. The authors think that by paying their fee, they’ve done their part and now it’s all on the host to promote the event. Why wouldn’t you talk up a public appearance? You have skin in this game, after all. The point is to connect to potential readers and make sales, right? Well, higher attendance equals greater potential for sales, so it is directly in your best interests to do whatever you can to increase an event’s exposure and entice people to come. Post about it online. Mention it in your newsletters. Mention it to people who talk to in your day-to-day life. Don’t just assume your host is going to magically reach every prospective guest, because they won’t. Even with an aggressive, far-reaching promotional campaign, they’ll miss people — people you could capture through your own modest efforts. The work doesn’t end when you’re finished writing. 1. The table of contents isn’t working. 2. Chapter 35 is probably supposed to be the epilogue. I’m not sure what the problem might be. I just tested the TOC on my base file and on the final Kindle file and everything is working fine for me. This is the first problem I’ve heard of. Anyone else out there having similar issues?